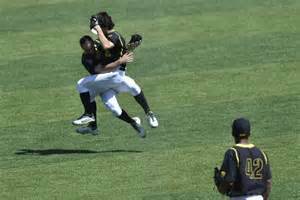 Baseball Injury, a term we as coaches and parents don’t like hearing, but as baseball is an activity no different than playing on the “Jungle Gym”, there will be accidents and injuries. For the most part, Thank God, injuries incurred while playing baseball are relatively minor compared to other sports. Since there is limited physical contact, at least by design, unlike football where the player is directed to knock another player down, serious injuries resulting from physical collision are rare. As coaches, we can apply these two methods to address and correct most of the potential injury risks our players may be subjected to. Let’s use these two engineering methods to see how, in the practical world, we can eliminate a baseball injury. The majority of ankle injuries are incurred when sliding into bases. Using the S.O.P. method, we immediately see the injury was a result of an improper slide, such as sliding too late which resulted in the foot slamming into the base with excessive force, thus the injury. As coaches, we need to pay more attention to teaching slide techniques. There are numerous links on this site which demonstrate the proper techniques to sliding. The other method of engineering out the risk, is to use Break Away Bases, at least for the younger to middle aged divisions. These types of bases move, absorbing the impact of a bad slide instead of the ankle enduring the impact. Teaching proper technique eliminates the majority of the risk, break away bases eliminate another 4%, leaving you with the improbable 1% risk of possible injury. For all practical purposes you’ve eliminated ankle injuries resulting from improper slides. There is of course, no way to control such things as a wild pitch hitting a batter, it happens at the major League Level, there’s no reason to believe it won’t happen at the Little League level, and a baseball thrown at 40 mph hitting an 8 year old hurts every bit as much as a 98 mph fastball hitting an adult. Teaching an S.O.P for avoiding wild pitches should be an integral part of hitting instruction. Throw it in when teaching Bunting if you want to disguise it or place limited emphasis on it, but Teach It! There are links on the site which teach and explain the proper methods for avoiding serious injury resulting from being hit by a pitch. Teach them, drill them, enforce them and you’ll eliminate 98% of the risk of serious injury. That’s not to say batters won’t ever get hit … only that chances are they won’t get hurt. The engineering portion of this problem is of course wearing batting helmets and any other assorted protective equipment readily available today. It’s important to remember … 95% of accidental baseball injuries can be eliminated through proper technique and protective equipment. There’s a lot of protective equipment available for players of ALL ages, some more familiar than others. I’m going to give you a list of potential protective equipment you can consider using. I’m not endorsing or implying the use of these products. In fact if you wore them all you’d resemble a Knight in Shining Armor, totally impractical to play in. Padded Catcher’s Gloves: These gloves are worn inside the catcher mitt to afford extra protection to the hand. They are made of leather, fingerless, with a padded palm to reduce the stinging of constantly catching 85 mph fastballs. 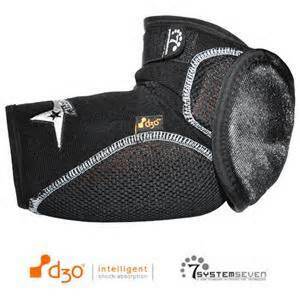 Knee Savers: These are foam pads which attach to the catchers’ shin guards and afford extra comfort when kneeling. 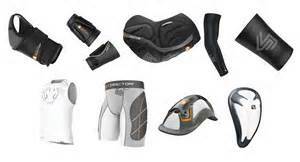 Batter Shin Guards: These are plastic shin guards similar to catcher gear except smaller, 6” to 9” in length and wrap around the batter’s shin. Available for left and right handed hitters. Batter Ankle Guard: This is similar to the shin guard, some solely protect the ankle, while others incorporate the shin and ankle protection in one piece of equipment. Forearm Guard: This plastic guard wraps around the forearm protecting it from being struck by a wild pitch and incurring a break or crack of the forearm bone. 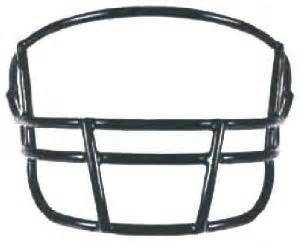 Elbow Guard: Similar to the forearm guard, some will incorporate the elbow and forearm guard in one piece of flexible equipment. Elastic Bandages and Braces: These braces come in many different designs and material and are quite effective in helping eliminate injuries to a particular body part a player has had a history of problems with and also helps stop further injury of a weakened or suspect injury to a particular body part. They specialize in Ankle, Hamstring and Knee braces. 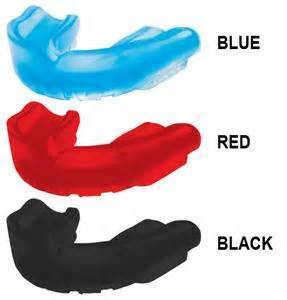 Mouth Guards: Mouth guards are normally associated with football, but a simple mouth guard can prevent serious dental injury resulting from a Bad Hop ground ball to the mouth. Sliding Pads: These are pads worn beneath the uniform to help eliminate bruising, scratches and the famous raspberry players incur when sliding on a hard surface. 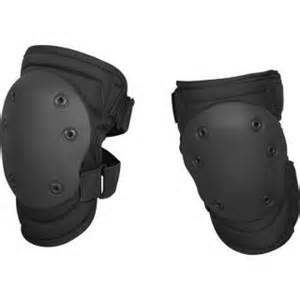 They come as a hip pad and knee pad protection. Heart Guard: This 6” x 6” - 3 ounce plastic square attaches to the players upper body with elastic straps and protects the heart from possible blunt force injury. It’s made of High Density Polyethylene which is very strong and durable. Some equipment is actually more of a treatment than a protective, but the usage is so common they actually become a preventive to a more serious injury. Thus are the Ice Packs which pitchers utilize every time they pitch and players with strains also use. They come in various materials and designs, but zero in on shoulder and elbow or wrist and elbow inflammation, which are common injuries. There are of course the more familiar catcher gear, batting helmets, with and without face guards and wrist bands commonly used by players in an attempt to protect themselves from injury. 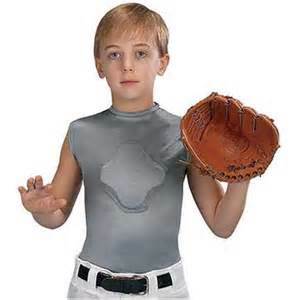 As a Coach or Parent, teach proper technique and use common sense concerning protective equipment and there’s a 99% chance your players will have a long and fun filled baseball career enduring only a few blisters and minor scrapes.